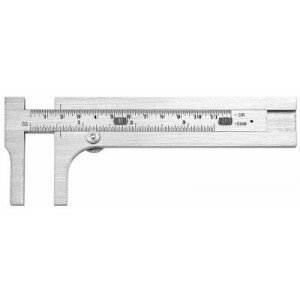 424 Starrett Circumference Gage and Slide Caliper The Starrett 424 Pocket Slide Caliper and Circumference Gage has a Range diameter of 0-3.5" with 0-11" Circumference with 1-3/8" Jaw Depth. It is designed for gaging steel wire and drill rod to the American Steel & Wire Company (Washburn & Moen) Standard and checks sizes from 0-36. It is also known as United States Steel Wire Gage. Features decimal equivalents on the back of the gage and has a satin finish. It is carefully tested for accuracy after hardening.